This week is going to be dedicated to creativity. My pet peeve is companies who look at what their competition does, and then just copy the same products, advertising, client seminars, etc.... But that is what happens. We all want to make the "safe"choice. A lot of people hate the cliche term "Out of the Box", but it really is good verbiage for how we need to think in business. Inside the box is safe, vanilla, boring. When you do reach out, you can have some great results (or if you go too far you can look ridiculous, so don't just be nutty....be creative). This is especially hard for law firms, accounting firms and other professional services companies, as they need to mix creativity with a serious image. But it can be done. If anyone has any "creativity boosting" ideas...please email me and I will try to add them in to my posts this week. The Guest Blogger this week is JD Moore. JD is a small business marketing coach, consultant and all around marketing guru. He is the founder of Marketing Comet and he writes one of the best marketing blogs that I read regularly. I'll admit it – I don’t really like to network. At least I don't like the way it usually happens. I do understand how important networking can be for small businesses. This is how things usually work: I go to a Chamber of Commerce networking group and everybody I meet there tries to sell me whatever they do. There will be a bunch of CPAs and insurance agents there, and some various services. Or, I go to a leads group and there is one plumber, one mechanic, and one web designer there. My theory on networking is that I don't network to meet customers. 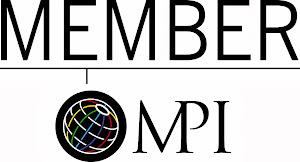 I network to make business connections that may become part of a vast referral network. I need to be hanging out with people who are successful, do something in a space similar to what I do, and who aren’t trying to pitch me. A great solution is vertical networking. 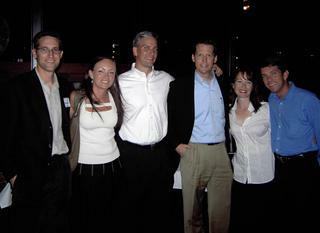 Vertical networking is a concept developed by Stephen Melanson and Peter Cross who founded the Overlap Group, http://www.overlapgroup.com. Overlap is a group where both providers and consumers of marketing and strategy-related services network. Overlap meetings are the most stress-free networking events I have ever attended. People gather, set a stack of their business cards out on a table and talk casually. Then the Overlappers gather in a circle and go around introducing themselves and what they do in 10 seconds. Then people are free to meet those whose introduction held some interest. The rules are pretty simple, members do not try to sell to each other, and they aren’t allowed to bring marketing materials other than business cards. Of course, if I needed to hire a web or graphic person I would probably go to one of my Overlap contacts. The basic idea is that people who offer similar services are far more likely to be able to refer business to each other. I always thought a great fusion-networking arrangement would be a contractor, landscaper, and interior designer group. Of course you are always thinking of ways to serve your customers right? Naturally being a source that they go to for referrals will make you even more valuable to your customers. I have an amazing attorney, CPA, dentist, and chiropractor and I refer clients and non-clients to them all the time. My attorney has been one of my greatest sources of referrals. To reap the rewards of vertical networking you must get past seeing like businesses as competition. If I own a wine shop and the store next door has a fine beer selection, think of the cooperative marketing and referral opportunities we could generate. In general, the best place to open a restaurant is in an area with a lot of other restaurants. This is why shopping malls exist – together the stores can do better business than separately. 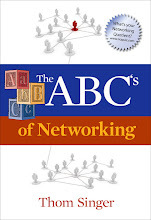 Of course your networking goal is to build a network. Think about becoming a hub for a vertical market. Let’s say that you own a housecleaning service. In your network you also have interior decorators, a carpet installation business, a landscaper, a company that installs hot tubs, and 12 other home service businesses. How quickly can you build your reputation as the go-to person for home service? What effect could that have on your bottom line? Please continue to network. But the next time you go to a networking meeting don’t try to sell anybody anything. When you meet somebody, think about who you could introduce them to that would make for a mutually beneficial relationship. Creating these links will build a network of support that will serve your business forever. J D Moore founded Marketing Comet when he realized that most small business owners were frustrated by marketing that just plain stunk. Marketing Comet is coaching that gives small business owners more customers, more profits, and a lot more enjoyment from their business. J D’s bold, in-your-face, and often quirky writing can be found at his regular Marketing Comet blog. He has been referred to as the short, blue-eyed devil of marketing for his impish and effective guerilla marketing style. His drive comes partly from his decades of martial arts training and partly from over a decade working with small businesses. His father, grandfather, and great-grandfather all owned small-businesses – it's in his blood. Thank you JD for a GREAT "Guest Blogger Friday". If you do not know about "The Blog Herald", you should. It is a great collection of posts about all things important to blogging and the blogosphere. The editor of The Blog Herald, Duncan, has a great series called "100 Blogs in 100 Days" where he daily exposes his readers to interesting and eclectic blogs. The wonderful news is that "Some Assembly Required" is the 51st blog in the series. I am very honored. Thank you to Duncan and The Blog Herald. That is right. It is time for your organization to start thinking about holiday cards and gifts for your clients, prospects and "friends of the firm". The sooner you start planning, the less of a financial hit your budget will take, and the annual "headache factor" will be reduced (not eliminated...just reduced). If you have not already begun this process, you are already late. The first thing to remember is that it is NOT "Christmas"....... it is "The Holiday Season". Do not use the term "Christmas Card" to describe those fancy folded and gold embossed greetings that you will send via snail mail. The political correctness police have won this discussion. Most law firms, accounting firms, companies and other organizations think that their holiday card is a great marketing tool. They invest many hours picking the right design, and compiling extensive mailing lists. Many must think that they are the only ones who send such items. The truth is that your clients will receive dozens, if not hundreds of cards. They may not even notice you sent one. My recommendation is that if you are going to send cards, you commit the time to write a handwritten personal note in each one. Yes, this is not the easy way out, but it will stand a chance of being noticed....as most come cards with only a signature or worse.....a printed greeting. (if you are just going to gold emboss your name...save the money and send it to me). And don't cheat and have your secretary forge your name on all the cards (no matter how good she is at recreating your signature). There are no shortcuts to good marketing. Write a few sentences thanking them for their business or sighting a success you shared in 2005 and sign your own name. A real effort stands out. A short cut is seen as just that. As for gifts, I am a big fan of gifts, because so few companies actually do it. Yes, there is a financial commitment, but the right gift will stand out. A local accounting firm orders a custom block of chocolate with their logo molded on it (remember they order this in September for December delivery). It is the best tasting chocolate I have ever tasted and everyone who is on their gift list talks about the unique and delicious gift all year long. Another choice is to have a client holiday party. You can do these big or small, at your home, office or a restaurant. The trick is to schedule it early in the season (that means early December) as to not be in competition with all the other holiday parties, events, etc.... I have on friend who rents out a small restaurant and invites 40 - 50 couples (his biggest clients and a guest) to join him. He always finds great restaurants and rents the whole place on a Monday or Tuesday night. Once you have been to one of his Holiday parties, you always want to come back!!!! The sad part is that most companies wait until the first week of December to decide on what to do. At this point you are limited to whatever is left in stock, and no restaurants with party rooms have any open dates. This means these companies either skip the whole thing (bah hum bug) or do it second rate. If your company has not talked about this, and you are reading these words.... RUN, get to it NOW!!! PS- Give all your employees and clients the perfect holiday gift: A copy of my new book "Some Assembly Required: How to Make, Grow and Keep Your Business Relationships" (New Year Publishing 2005). 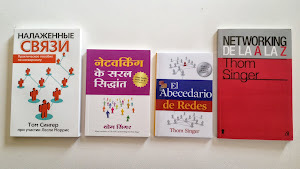 Available at www.thomsinger.com. In 488 pages of "The World Is Flat", Thomas Friedman does a wonderful job of explaining the new global world in which we all live and work. "In China today, Bill Gates is Britney Spears. In America today, Britney Spears is Britney Spears - And that is our problem." Think about that one for a while. YIKES. "Start by doing what is necessary, then do what is possible, and suddenly you are doing the impossible." -St. Francis of Assisi (1182-1226)Italian friar, founder of the Franciscan order. Often times we are unable to get started because we fear that the task is too much for us to handle. We have so much to do that we do nothing. We are paralyzed. Our chances to shine at work, home, in the community pass us by because we do not take action. Has this ever happened to you? It happens to me. I feel that I do not have enough experience, assistance, support or determination to tackle the mountain of work in front of me.... Or I am just scared to fail. The Chinese have a saying: "The journey of a thousand miles begins with one step". And it is true! The best way I have found to complete a project is to start the project. I had wanted to write a book for more than a decade. I had many ideas and outlines, but I never got started. Once I made the commitment to write "Some Assembly Required :How to Make, Grow and Keep Your Business Relationships" I did just what the quote at the top of this page says. I started small. I wrote two to four pages a day. After a week I had a chapter, and within a couple of months I had a full draft. What seemed impossible is now the reality of my first book. So what assignment is waiting for you? Take that first step today. 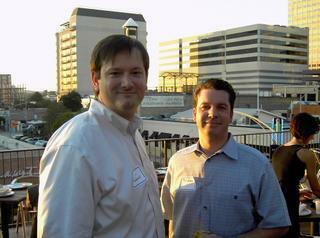 I am a "Guest Blogger"
I got Bryan Menell from the Start Up Austin Blog to be my "Guest Blogger" on Friday... Meanwhile across the Blogosphere I am the guest blogger at Steve Harper's Ripple Effect Blog. Today is "Guest Blogger Friday". Our "GB" is one of my oldest friends, Bryan Menell (I have known him since Foothills Junior High in Arcadia, California...we are so old that they now call it Foothills Middle School. Not sure what is the difference?). Bryan Menell is the CEO of Fusion Learning Systems, a company he founded in 2001 that provides a full range of learning services tailored to fit clients specific business goals and learning objectives. The company works with industry leaders such as Dell, Harcourt, Pearson, and LeapFrog. 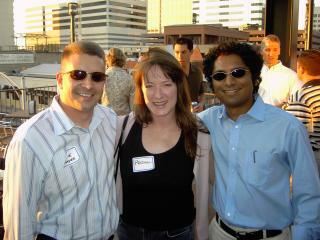 He enjoys networking and idea sharing with entrepreneurs. He frequently participates in local panel discussions on technology and startups, guest lectures at the University of Texas, and has been featured in USA Today, the Austin Business Journal, and Family Money magazine. 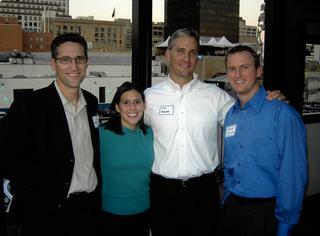 Bryan was a finalist for Ernst & Young's Entrepreneur of the Year, and recipient of an Austin Under 40 Award. 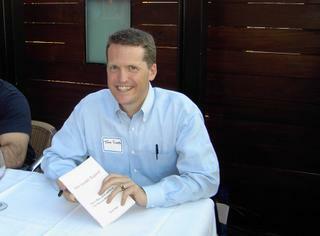 In the mid 1990's I started a small consulting company. After a few years we had a great niche in the market, and I needed to hire some really talented folks. This is before the internet, so recruiting was done the old fashioned way. We had already tapped out our employee’s friends and contacts, and made a few really good hires, so I decided to use a professional recruiter. Rather than go through the Yellow Pages, I asked our employees and friends of the company what recruiters they had worked with, received calls from, and seemed like they were movers and shakers in their industry. 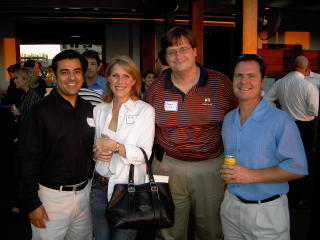 This networking led me to a recruiter in Houston, whom I would have never called or found otherwise. I always strive to get as much out of my business relationships as possible. To me, this means not just hiring this recruiter for his services, but understanding his business, who his customers are, what has made him successful, and who I know that might be looking for a new position. The recruiter was rather savvy as well, and didn’t just ask for the job posting, but wanted to know about my company, what type of people are successful, what customers we service, what are our values, and my philosophy as a business owner. In the course of finding candidates for us, the recruiter mentioned that he had done lots of recruiting work for a consulting company with similar values, and he had placed several people with the skill sets I was looking for at this company. It was even founded by a former Big Six guy, like me. He asked if I would like to have lunch with executives from this company when I was in Houston interviewing candidates. To make a long story short, I did meet with that company and ended up selling my consulting firm to them in a seven figure deal. I never even knew this company existed, let alone was looking to do acquisitions. They were three degrees away from me, but it took some networking to get there. Invest in your business relationships and you will reap rewards. Don’t just deposit your revenues and write checks from your bank, get to know your banker. Do the same with your attorney, tax advisor, key employees, and your telecom provider. Ten years later, I still use that recruiter in Houston whenever I have a recruiting need. Thank you to Bryan Menell for a great post. On this day in 1914 my father was born in Los Angeles, CA. World War I had not yet occurred. It was only eleven years after the Wright Brothers flew at Kitty Hawk. The population of LA at that time was around 500,000 people. He has lived in the most amazing time in history. It is hard to imagine the things that he has witnessed in his lifetime. Society in America has changed so much (for better and worse). He was almost 52 when I was born, and retired when I was in eight grade. He was always around to coach my teams or attend my school events. While older, he was (and still is) in great shape for his age, so although he was 70 when I was 18 we went water skiing in Singapore and snow skiing in Lake Tahoe that same year (1985). 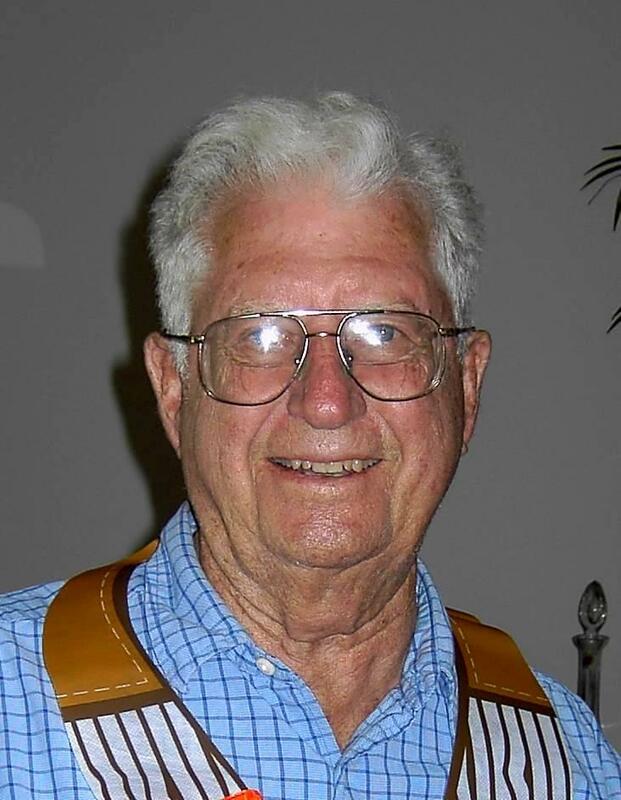 This year, at 90, he purchased a new car. He drives, bowls, golfs, goes dancing with his many girlfriends (he is a widower), swims, and loves to play cards. I just hope that "it" (whatever it is that makes him so amazing at age 91) is genetic and that I inherited it!!! Dad, Have A Great Day. You are a wonderful father!!!! In 1994 I read a book by Tom Peters, "The Pursuit of WOW!" which I really enjoyed. What made the book so enjoyable was how unconventionally it was arranged. It was more like a 350 page magazine than a traditional business book. It has more than 200 vignettes of wisdom that are playful, pithy and punchy. Yesterday, while I was looking for something on my bookshelf, this brightly colored tome jumped out at me. It called out "put me in you blog". (Okay, the book did not really talk). "Sometime during the two-year curriculum, every MBA student ought to hear it clearly stated that numbers, techniques, and analysis are all side matters. 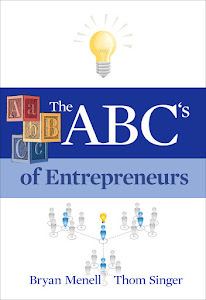 What is central to business is the joy of creating" -From Peter Robinson in The Red Herring. This short paragraph is a great reminder that business is not all about formulas. Very often in a company someone higher up the chain (the sales manager, CEO, Board of Directors or venture investors) lose sight of why they are in the business and become totally focused on the numbers. They turn up the heat on those down the line, and the pressure takes all the joy, the "WOW! ", out of the job. While I am all about making a profit (I have seen first hand what happens to a business when the economics don't work), we should never lose sight of the joy in our careers. Work should be fun. Getting out of bed in the morning is delightful if you have an exciting place to spend the day. Do you still find joy in your career? Do you foster and environment for your employees and co-workers that allow them to use their creative talents to help advance the cause of your organization? Do you pursue WOW? Last night was the official launch party for my new book, "Some Assembly Required: How to Make, Grow and Keep Your Business Relationships" (New Year Publishing 2005). 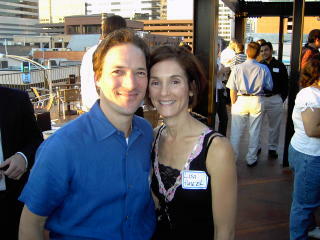 The party was held on the rooftop of SIX Lounge, a great bar in the Warehouse District in Austin, Texas. We had a great time, sold a lot of books, and over raised $200 for the Austin Sunshine Camps. Below are some great photos of some very cool people. A BIG "Thank You" to Ed Kozun of Kozun Capital Management for sponsoring the event. If you own a business or manage a team, how often do you reward your team for a "job well done"? Very few business professionals achieve their success in a vacuum, but rather most have a team of employees who work hard and help their boss reach the stars. I once worked for a guy who felt that doing good work was just "their job"... and he never believed in thanking people for doing what he already paid them to do. I even heard him say that his people should thank him for having such a great job. On the flip side, Steve Hung was one of the best bosses I had. Very early in my career I sold advertising. Steve managed sales professionals all over the country. Those who succeeded were rewarded financially by the company .... but also were praised with public kudos and individual bonus rewards of lunch, dinner or other small tokens of appreciation. One time Steve told me that if I hit a sales quota on a project he would take me out for a sushi dinner... no limit. For a twenty-five year old kid, the cost of a good sushi meal was not in the budget, so this was very motivating. I hit the number, but years went by before I ever saw Steve again (he lives across the country). By the time I did, I no longer worked for the company. He was going to be in Austin and he called, reminding me that he owed me sushi as a reward for hitting that extra high quota years before. Now that is a good boss who not only knows how to reward his people, but keeps his promises even years later. How about you? Do you ever walk down the hall and grab a couple of your team members and invite them to lunch and say something like, "My treat, you do a great job around here and I want to just show you my appreciation?" If not, why not? A little thank you (the cost of a ten dollar lunch or a Starbuck's giftcard) can go a long way. I recently participated in a program at my church called CRHP. Since this blog is not about religion, I will not go into the spiritual details of the program, but I was fortunate to spend six months as part of a committee planning a weekend retreat for others in our parish. The team of men who made up "CRHP 25" were some of the finest people I have ever met in my life. We all came from different social, economic and ethnic backgrounds and our ages varied from twenty-something to sixty-something. Some are wealthy (very wealthy) while others struggle with financial issues.... and we all had had different political views. Not only were our differences not discussed, they were never an issue. What brought us together was the common goal of planning this retreat and the desire to serve others. Through this experience I discovered that when you do not focus on "what do you do for a living", and other such trivial questions, you discover that we have more in common with our fellow man than we might otherwise think. No matter what you do for a living, or how successful you appear to be, everyone faces problems at some time in their life. Yet sometimes our attention is just focused so strongly on our own issues we forget that we are just people. Unconditional Love. Regardless of what you do for a living, you will benefit from having passion about your family and your career. If you love what you do (and whom you do it for) the results will be spectacular. It will never feel like work, but instead it will just be part of who you are as a person. Forgiveness. Unless you are a hermit, you will encounter other human beings, and thus there will always be situations where someone will do you wrong. It could be a co-worker, a boss, a family member, a competitor, a client, etc.... Whatever the case, if you spend too much time dwelling on the "wrong doer" you will waste your energy. If you can forgive the other person, you will be able to focus your attention on growing your business and other beneficial tasks. Service to Others. Dedicate your actions to your family, your clients, co-workers and/or humanity-at-large. While selfish people can certainly succeed financially, if you are not finding some manner to serve others, then it can be very lonely at the top. Your reasons for doing what you do every day should be dedicated to others. Provide your clients with the best products and services. Your successes will be more rewarding when you know that you make a difference in the lives of those around you. In your professional, personal and spiritual life if you never stray from "unconditional love, forgiveness and service to others" then the world will be your oyster. You already know that networking for leads is essential to growing your business. You know that developing and maintaining contacts is fundamental. You know that getting the word out about your capabilities is the key to launching new client relationships. So far, so good. But way, way too many entrepreneurs and service providers are stuck in the mode that I call "This Minute Networking". That's the one where you introduce yourself to a stranger at a networking event, describe your business, chat for a few minutes, and leave the interaction dejected if your new acquaintance doesn't seem to have a sales lead for you. What, you can't help me This Very Minute? Should I continue listing the many services my firm provides, to help you think of somebody whom I should call?It's a funny thing to see this behavior repeated so often, because it never happened in old-fashioned networking - the kind where we checked in with and relied upon trusted friends and colleagues to see what had changed in their lives and fill them in on what's new in ours - hoping that in some of these synch-up conversations, opportunities for one or both of us would emerge. We never expected these long-term contacts to be able to produce a lead for us on the spot. So why would we expect that our new-found friends would be able to do that? But I don't do that, you are saying to yourself. I meet people and chat with them, help to understand what I do and vice versa, and agree to keep in touch. I am positive that is true. But haven't you met, at least a million times, people who ask you "Do you know anyone who might need these kinds of services?" or "Could I send you a brochure?" What these folks miss is that the range of your business services is probably the least interesting thing about you. After all, most of our businesses, as we describe them, are not all that earth-shaking. You're not trying to connect with a new person on the level of "hear about my business, and keep it in mind." That's backwards. You want the person you are meeting for the first time to say, "That Ellen - she is so interesting. I'd love to keep in touch with her. I didn't grasp exactly what she does professionally - something about software development - but I'd love to have her as a contact." Then there is glue. Then you'll remain in this person's consciousness, and when anything that remotely smells like software development opportunities comes across her desk, she'll call you - gladly. The thing about business development networking is that it's about the people you meet and the connections - intangible but sticky as hell, in the best cases - that you establish with them. That's the thing that you want to accomplish Right This Minute. Your range of business services, your credentials, your client list - all of that can wait. To capture a share of this person's brain, to get some of his or her busy neurons firing in the direction of you and the new friendship you're establishing - that's the brass ring. Meeting new people at networking events or on-line is the Johnny Appleseed phase of business development. Have patience and focus on the wonderfulness of the individuals you meet - and believe me, those apples will follow. Thanks, Liz, for a great guest blog. Attention readers: We are looking for next week's "Guest Blogger Friday" article. It could be you!!! send me an email if you are interested. I believe you must give credit where credit is due. I stumbled upon a blog today called "Marketing Comet: Small Business Marketing Secrets", by JD Moore. His posts are full of great information that should be of interest to the readers of this blog. I added him to my list of recommended blogs. I hope you find it as informative as I did. Internal Meetings. Yuck. Most people would rather stick pins in their eyeballs than sit through most of the meetings at their place of business. I once worked for an organization that had more in-person and telephone conference calls in a week that we had local employees. The boss would call "mandatory" meetings on a whim, or cancel long-scheduled meetings at the last second. And the length, they would last for hours. No matter how much people like to hear themselves talk, rarely should a meeting go more than one hour. Have an agenda. Never hold a meeting where an agenda is not distributed to attendees at least one hour in advance (preferably longer). This allows those participating to understand the purpose of the meeting, and add any important topics to the agenda in advance. Having an agenda will also help keep the discussion focused and make sure that important topics are not overlooked. Also, assign a time value to each topic and be sure to hold to that,.... don't allow meetings to run longer than planned. Respect other's schedule. Try not to call meetings at a moment's notice, but more important, if the meeting is regularly scheduled (like a weekly sales call), do not make it a habit of canceling at the last minute. Treat internal meetings like you would any other important event on your calendar. You would not cancel on a huge client because another prospect wanted to meet at that same time (you would tactfully find another time).... so do not cancel on your team. By canceling internal meetings cavalierly, you are sending the message that meeting are not important. Take notes and follow up. Have someone take notes and send out a follow-up email recapping what was discussed and highlighting any action items that were assigned to specific team members. Make sure that people are held accountable to what they agreed to accomplish before the next meeting. 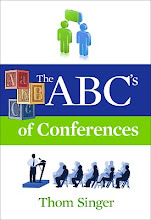 Adherence to these tips will make your meetings more productive. And productive meetings are better than sticking needles in your eye. Are your clients happy with the service you are providing? Are you sure? Really, really sure? I had a conversation yesterday with a friend who is CEO of a local company. He is ready to fire one of his primary vendors, even though they have a long history of working together and have developed a personal friendship. The bad news is that he feels that he can get better service for a more competitive price elsewhere. He shared with me that the price is not the reason for switching, just an added bonus. He is very disappointed with the lack of attention he gets from his friend's firm. Meanwhile the vendor thinks that this guy is his best client. He has no idea that the person feels neglected and that his customer service is sub-standard. They have worked together for so long that he thinks he knows what this client needs, (in fact, he tells the client this) but he obviously does not take the time to meet with the client and ask the tough questions. He lives in a fantasy land where he is providing great service. But this is not how the client sees the situation. This happens regularly. We fail to see our own weaknesses, and if we do not ask our clients for feedback, we just continue along the same path of delusion. I recommend that you regularly schedule "reality checks" with your clients. These can be formal or informal, but you want to make it clear that you cherish your working relationship and want to better serve them. If things are great, congratulations. If there are issues, it is best you hear them from the client now....before they have moved the business down the street. Most professionals that I know do not survey their clients in this manner because they are scared of hearing about any problems. They don't actually site this as the reason, but it is very clear that they have come to appreciate their own ignorance. When is the last time that you asked your customers if you were doing a good job? If you do not know, or it was more than six months ago then I suggest you shut off the internet, quit reading my blog, and go find out. Otherwise you will have lots of time on your hands when your clients fire you!!! I am currently reading "Swanson's Un-written Rules of Management". 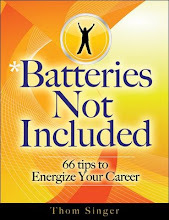 It is a small booklet written by William H. Swanson, Chairman & CEO of Raytheon Company. He compiled "33 Rules" in a spiral bound book, which he gives out as a take-away when he speaks or to anyone who writes him and asks for a copy. I wrote, he responded, and I read it with great interest. His advice is fantastic. Rule 14: "Strive for brevity and clarity in oral and written reports". Amen. I often think business professionals believe they are paid by the word. If you want to be understood and if you want to have an impact: Keep it short and get to the point. I am a big fan of hosting special events for clients, prospects and others in your network of professional and personal contacts. These can be educational seminars, user's conferences, cocktail/networking parties, small dinners, gatherings to sporting events/concerts, or something totally out-of-the box. Too many companies shy away from these types of marketing events because of the expense involved with doing them correctly. However, since your goal is to stand out from competitors and to be remembered, this is actually good use of your business development dollars. A software company invited all of their corporate clients to their headquarters in Seattle for a us three-day users conference. While the event was focused on business, they also had some entertaining outside speakers, a boat cruise on Puget Sound, plenty of give-a-ways (I got a great jacket with their logo which I will wear often once the weather in Texas cools down), and allowed their clients to get to know them on a personal/social level. It fostered loyalty with those they do business with, and created cross-selling opportunities between the attendees who otherwise would have just seen each other as competition. Two salesman who called on the same industries (they were not competitors) hosted a monthly dinner at Sullivan's Steakhouse for two years. They would invite two attorneys, two venture capitalists, two bankers and two CEO's who were clients or prospects (all different attendees each month). There was no agenda, no sales pitch, just a chance for some key business people in the community to meet, network, and discuss the local economy. This lead to new business for both hosting companies, and became an event that people wanted to get an invitation. A major law firm holds a "Women's Conference and Retreat" at a top resort every other year. They host the top female executives from their clients and prospects (as well as other VIP women) for three days. In between the great meals and spa treatments, they had nationally recognized business/motivational speakers and lots of networking opportunities. Only the women in the firm get to attend, but the men don't mind because of the new business they bring in. I once took fifteen clients who had five-year-olds to a baseball game. I purchased a block of thirty tickets to the local minor league team (The Round Rock Express) and invited those in my network with kids to be my guests. For most of our kids this was their first professional game, and to this day (four years later), everyone still remembers the event. One client's wife recently commented "I sometimes get invited to business events, but that was the only time anyone ever invited Nicholas!". Find ways to interact with your clients and prospects that are unique and memorable. If you just keep doing the same thing that everyone else does, you can expect to have the same results everyone else gets (which makes you average). To get noticed you have to do something noticeable. Have you purchased a copy of my new book: "Some Assembly Required: How to Make, Grow and Keep Your Business Relationships" yet?. 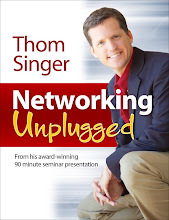 It is now available at www.thomsinger.com for $19.95. The "Weekend Blog" is off the topics of business development, PR, sales, marketing and networking. It is my chance to write about random subjects. The American pass-time of making every issue political (assigning every topic as "left" or "right") must come to an end with respect to the subject of the future of our energy supply. Our current consumption of fossil fuels will leave the planet drained of oil within the next 100 years. With one billion Chinese, and another billion people in other developing countries, beginning to raise their standard of living, more and more cars are hitting the streets around the world. While it is true that North America and Western Europe blew through oil like drunken sailors the past fifty years, that will seem like nothing in the next decades. It is time for the United States to do what it does best: Innovate and Invent. Over the past two centuries citizens of this country have discovered and created amazing things that have improved the human condition. While some would choose to vilify or focus only on the negative, the reality is that Americans have the ability to change the world for the better. When John F. Kennedy challenged America to get to the moon in less than a decade....people were inspired to go where no man had gone before. Scientists and engineers found new ways to do things and were able to send a man into space and return him safely to earth. We need a leader in Washington who can instill this same level of enthusiasm in the American people to break our dependency to foreign oil and invent new ways to power our cars and factories. This means that both political parties and all the special interests groups must stop trying to undermine their opponents and work together for a common goal. It may involve expanding our oil drilling in places like Alaska and the Gulf of Mexico in order to get ourselves through the next few years. And it will mean that everyone must look for ways to conserve energy. In addition, the oil companies will have to revisit their mission statements and see themselves as "energy" companies (For real, not just for marketing purposes), and be the leaders in creating alternative energy solutions. If they do not they will be left behind like the railroads who did not view themselves as "transportation" companies, and thus did not embrace the airplane. Since we will be out of oil this century, then they had better adapt anyway, or they will be then next buggy whip. Innovation and invention in the energy industry is the most important thing that America can do for our own future and the future of the planet. It is not yet too late, but the time is here now. No finger pointing at the other side of the political isle allowed (yes, that will be difficult for the likes of Tom Delay and Nancy Pelosi...who only exist because of their outspoken negative pontificating about the other party). Can we do it? Yes, I believe we can. It is time for another "Guest Blogger Friday", and today we have a great guest blogger in Monica Bay. Monica is the director of ALM Media Inc.'s Law Firm Inc., and Small Firm Business; and editor-in-chief of Law Technology News. She also writes one of the most informative and entertaining blogs in the legal business, The Common Scold. Oh, and she is the biggest NY Yankees fan on the planet!!! Chief marketing officers must remember an essential reality: No one -- especially a lawyer -- will admit they don't understand a sales presentation. Last year, I wrote an article for Law Technology News that examined why so few lawyers are using trial technology. After interviewing practitioners, consultants and vendors, it quickly became obvious that one of the main reasons lawyers resist technology is that they simply don't understand how it can help them service clients better, faster, and cheaper. Why? Because the vendors don't speak plain English. Instead, they overwhelm lawyers with robotic lectures riddled with meaningless clichés — and the attorneys are simply too embarrassed to admit that they don't have a clue what the vendors are talking about. Here's the first sentence of a typical press release: "The Widget Company, the world's leading provider of strategic, scalable, mission-critical enterprise-wide applications, has released WiDget 5.3.2XS, our robust, client-centric solution, now available in blue, pink and purple form factors." That's truly how vendors talk. But guess what: This nasty trend is not just the domain of the techies. The marketing/biz dev folks are getting just as bad. Strategic planning: Who in their right mind would do non-strategic planning? Client-centric (a.k.a. client-focused): Oh please. Who is going to offer services that aren't geared toward clients? Are you going to offer opposing-counsel-centric services? Leverage: Only on rare occasions is this word used appropriately. Value-added: Is there an industry that doesn't use this ridiculous term? It sounds like something you would negotiate when buying a car. Deploy: You're law firms, not military operations. Seamless: Reminds me of a sewing class. Solution: Hands down, the most overused, worthless word on the planet. Good only in math class, chemistry, or when you give up and call Nanny 911 because you can't stop your two-year-old's temper tantrum. It is not a marketing, legal, or technology word. * "Our solution: to sell our ability to leverage efficiency." * "[We are] the leading provider of high impact strategic market research..."
* "[We] provide high-impact information and workflow solutions ..."
* "...we have helped clients develop and implement creative marketing and advertising solutions..."
* "... specialists in developing business solutions..."
* "Establishing metrics to align sales and service strategies with key client initiatives." * "The strategic objective is competitive distinctiveness." * "She created the only widely disseminated research initiative on strategic marketing perceptions..." Res Ipsa Loquitor! I challenge each and every one of you to start using plain English. I guarantee you that if you do, you will generate more "aha!" moments when you try to convert lawyers to the joys of business development. 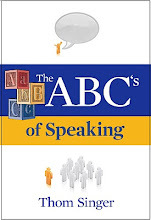 Speak in English, eschew jargon, and you will get them to drink the Kool-Aid. Monica Bay can be reached by e-mail at: commonscold@alm.com. Copyright 2005 ALM Properties, Inc. All rights reserved. A version of this first appeared in Law Firm Inc. Full story here. Thank you Monica for a great "Guest Blogger Friday". 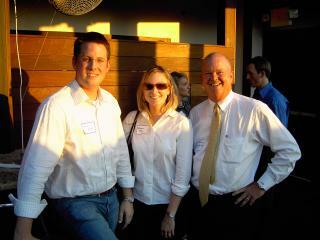 I attended a fantastic presentation yesterday at the Austin Chapter of the Legal Marketing Association. The speaker was Suzanne Donnels, the CMO at Allen Matkins, and one of the legal industry's leading experts on the application of competitive intelligence. Her program, on the importance of competitive intelligence (what you know about your competition) and business intelligence (what you know about yourself), made me spend the rest of the day pondering why gathering information is important. Regardless of your industry, you have competition. If you don't, you are either fortunate or living in the clouds. Companies often dismiss their competition as either too far ahead of them (we can never be like them, so why care what they do?) or too far behind (they are second tier, we need not be concerned). However, you can learn a lot from what your competitors are doing and advance your success by poaching their best people, practices and clients. This is where having quality market research is important. The good news is that it is easier than ever to discover what your clients are doing (can you say "Google"). The bad news is that it takes time to do research and even more time to compile all the information into a usable format. If your company is not making this a priority, you are not doing all you can to succeed. Equally paramount is internal business intelligence. How much do you know about your own firm? Your strengths, weaknesses, and position in the marketplace? ....and how much do you know about yourself? Honesty is the best policy in this area. Do not just pat yourself on the back for what you do well ....really look at where you come up short. If you know the areas you do not excel in, then you can position yourself around what you do best. And knowing how you stack up in the marketplace means you will be realistic when talking with clients and prospects (just because your mom thinks you are the best on the planet does not make it a fact). Suzanne did a great job with her presentation, if you compete against her firm, watch out. They know every move you make!!! No matter how much we enjoy the various aspects of our personal and professional lives, some days we just don't want to get out of bed. You know the feeling when you hit the snooze button for the fifth time. The thought taking a shower and driving to work makes a root canal sound appealing. And the last thing you want to do is to have to happily engage in conversation with coworkers, clients, prospects or any other human (somehow we can always find the energy to talk to the dog). We all have those days. I will admit, that I don't feel that way too often, but today was one of those days. I have a long list of things I have to get done at work, home and for promoting my book.....but I would rather just sneak off and rent a kayak and spend a few hours paddling along Town Lake. Yet I know better. While playing hookey might make me feel better in the short term, it wont let me accomplish anything for the day, which will just leave me feeling worse tomorrow. This is especially true if part of your job function involves business development, networking and promoting the image go your company. When you are not feeling on top of your game, it is easy to push these more social aspects of your job to a lower level of priority. I see this with accountants, lawyers and other professional service firms. They know they should be networking and looking for future business, but they just don't feel up to it, so they hide under the covers of the current client work, repetitively hitting the "snooze button". But we know that we need to work on cultivating tomorrow's business today, or we could find yourself without anything to do when the current project ends. So if your business developing and networking spirit is up to speed, just do it anyway. Pick up the phone and schedule a lunch meeting or take a client to happy hour. Action will lead to results. Now, if I can take a client kayaking, that might just be the solution!!! 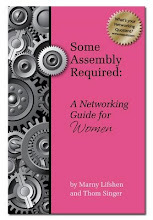 Order your copy of my new book, "Some Assembly Required: How to Make, Keep and Grow Your Business Relationships" at www.thomsinger.com. $19.95. Say Something Nice, or Shut Up! Scott Ingram over at NetworkInAustin.com has a great post this week on his blog reminding us all not to say disparaging things about our competitors. It is very easy to sling the dirt on our competition, especially if we have legitimate reasons....but doing so rarely works to your advantage. Scott tells the story of someone "bad mouthing" a competitor, whom happens to be someone Scott respects. The person who made the negative comments came off looking bad, as Scott's relationship with the other person was so strong that no random words could hurt the friendship. My suggestion is never talk about your competitor. Why bring them into the conversation? The odds are that the prospect already has an opinion, and to dispute that opinion is to challenge their judgment. Rest assured that nobody will be influenced by your trash comments anyway, and if they are, they will just as easily turn on you when the next guy comes along and undercut your reputation. If you are asked by a prospect about other companies in your industry, simply say something nice and then talk about your own strengths. I know one business owner who intentionally asks his vendors about their competitors. Those who talk negative automatically lose. He believes that those who go negative are not trustworthy, and he does not do business with people he cannot trust. If your strengths are not good enough to stand along side your competitor without showcasing their weakness....then get a new job. Mothers around the world have always said, "If you don't have something nice to say, then don't say anything at all." Listen to your mother. For those of us who are old enough to remember the "tests of the Emergency Broadcast System" regularly breaking into television and radio programs (I think they still happen, just not as often), we are grateful that we never had an actual emergency. These were in place during the Cold War, and mostly in case of a nuclear attack on the United States by the USSR. While we still face national security threats (international terrorism is a real threat! ), this is not a political blog. This is blog is about your career, building a network, marketing, PR and business development. In today's uncertain economic times, do you have a "Career Emergency System"? No matter what industry you work in, there have been a variety of companies that have failed. The best of companies have had experienced mergers, down-sizing, lay-offs and backruptcies. Industries that were considered immune to economic upheavals (ie: large law firms, accounting firms, healthcare, etc....) have seen new realities in the past decade. In order to be prepared for the possibility of an unforeseen career hiccup, you should constantly be taking on new tasks in your job and your volunteer activities that can expand your skill set. Invest the time to learn new things, and expand how you are viewed by your employer, co-workers and the business community. Test yourself. Try new things. If you are seen as someone with multiple talents, the chance of having multiple opportunities expands. I have known many people who have been promoted to jobs beyond their current ability. Some are shocked when others rise quickly on the career ladder, but I am never surprised. Those making hiring decisions know that people with a variety of skills adapt well and are fast to learn. Tell yourself that today is "a test of your Emergency Career System" and find a way to grow your business skills: lead a project team, read a book, write an article, join an organization, teach a class, or volunteer for a committee. It is much easier to prove your multiple skills to other now. Don't wait until you hear the words "this in not a test!" My Book Is Done !!! My book, "Some Assembly Required: How to Make, Keep and Grow Your Business Relationships", is done and ready to ship. To everyone who pre-ordered copies, they will be in the mail in the next few days. (By the way, THANK YOU !!!!). If you like what you read, tell a friend. Heck, tell two friends. Tell everyone you know. We also offer the book in gift packs of ten and twenty-five copies. The "Weekend Blog" is away from the topics of networking, sales, PR, marketing and business development. This is my chance to talk about anything under the sun (or rain clouds, as the case might be). I was in New York City for two days this week. I love NYC. There is something about it, when you drive over a bridge or emerge from a tunnel and you know that you are on Manhattan Island.....you can feel it in your bones that you are in one of the greatest cities in the world. I flew in to Newark, New Jersey and had dinner with my brother, Bill and his family. 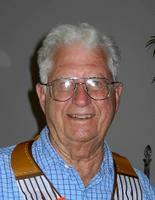 Bill is one of the giants in the business of saxophone repair (yes, every business has giants). He was working on the saxophone of a lawyer I know, who is also a musician. See, that is networking. I meet a lawyer from New York City who mentions he is an accomplished saxophone player, and I tell him about my brother's business. A month later my brother has a new client. But I digress. While in New York, I had a few hours before my meeting. The city was darkened by rain clouds, so I was pushed into a Starbucks (what, a Starbucks on a street corner in New York? ...or any city...how surprising....dang, they are everywhere). I plugged in my computer and accessed the internet and was able to get a couple of hours of work done, access email, send marketing documents to the printer and communicate with my co-workers all around the country. All while staying out of the rain and enjoying a latte. But the best part was I got to watch the people go by on Madison Avenue. There is something about the energy level of folks in New York. It didn't seem to matter about the rain or what the time of day, there were people on the street. I just wish it had been dry so I could have walked around a little more. I once heard that everyone should live in New York once in their life. I have not had that pleasure, and doubt that I will. However, I will encourage my kids to spend some time in the Big Apple. What is it they say? If you can make it there, you'll make it anywhere!! !